Kalong Grow by Guanokalong is a potent organic fertilizer for your cannabis plants’ growth period that contains bat guano. Thus 100% natural product contains nutrients that your plants need to grow strongly. Kalong Grow by Guanokalong is a growth fertilizer that contains 100% natural bat guano. It contains all of the nutrients that your plants need to grow strongly during this first phase. 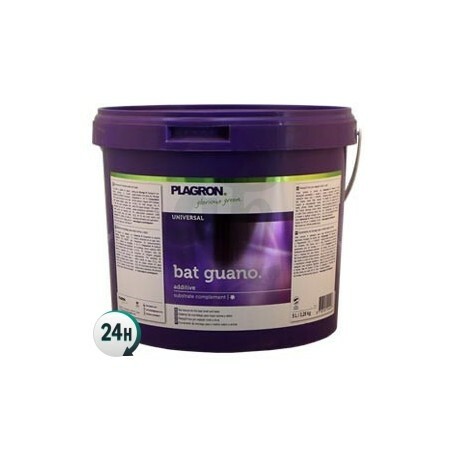 With this liquid guano for your plants’ growth period, you’ll be able to safely grow your plants with all of the nutrients they need; it’s absorbed incredibly fast although it doesn’t have many salts due to the fact that it’s organic, so your plants can make the most of it. When used alongside other products such as Liquid Extract by Guanokalong, you can increase the health and size of your plants’ roots, making them capable of absorbing and making the most out of everything they can; this increases root growth and therefore plant growth in general, increasing yield in the process too. Use 10-50ml per liter of water, depending on what phase your plants are in. We recommend using it alongside Liquid Guano Extract. 5ml per liter for small cuttings. 20 day old seedlings, 10ml per liter. 40 days old, 20ml per liter. 60 days old, 30ml per liter. 70 days old, 40ml per liter. 80 days old, 50ml per liter. It does not damage your plants roots due to its low salt content.